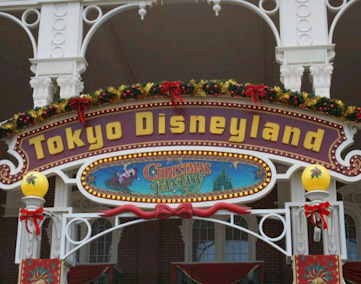 Hard to imagine that Tokyo Disney Resort® has been around for 25 years but it has. And to celebrate, the resort is currently commemorating its 25th anniversary with a five-stage, year-long celebration entitled Unlock Your Dreams. Both Tokyo Disneyland and Tokyo DisneySea began the fourth stage of celebrations on November 7 and will continue these through the Christmas and New Year season until January 18. During the Christmas festivities, Tokyo Disneyland will present Mickey’s Jolly Snowtime, a heartwarming, fantasy-filled musical show, at a special stage set up in front of Cinderella Castle. There will also be a Christmas version of the ever-popular Tokyo Disneyland Electrical Parade Dreamlight. The park will be adorned with Christmas decorations including a giant Christmas tree in the World Bazaar emblazoned with a 25 to mark this special anniversary. Tokyo DisneySea will present Candlelight Reflections featuring a Christmas tree of lights rising from the waters of the Mediterranean Harbour creating a romantic, holiday atmosphere. In the American Waterfront, there will be singing and dancing to a live big band at the Broadway Music Theatre, and Disney characters dressed in Christmas costumes will make appearances to greet guests. All three Disney Hotels – Disney Ambassador Hotel, Tokyo DisneySea Hotel MiraCosta and Tokyo Disneyland Hotel – will hold Christmas events, and along with the six Tokyo Disney Resort Official Hotels will be decked out with festive decorations and Christmas trees. The Resort also has a great line up of festivities during New Year. At Tokyo Disneyland and Tokyo DisneySea traditional Japanese New Year’s decorations with designs to highlight the 25th anniversary will be set up at the entrance to each park from January 1 through January 5. In addition, Mickey and Minnie Mouse will be dressed in their best kimono to greet guests visiting the Parks. Finally, the Ikspiari Fantastic New Year 2009 celebrations which will run from December 31, 2008 through mid-January 2009 will include the Ikspiari Countdown Celebration 2009 featuring a concert of Beethoven’s Ninth Symphony and other live music performances on New Year’s Eve. When the countdown reaches zero, the shops in the complex will start their annual sales of fukubukuro (lucky bags) for the earliest chance at luck. A winter sale of seasonal items will also take place.